Solihull Sports Injury Clinic, West Midlands, have video gait analysis equipment to assess your gait on a treadmill when running and walking, we can go into your training establishment and film your technique and training session then review it on our softwear in the clinic with your coach for technical feedback. Atlas Solihull Sports Injury Clinic use the video gait analysis as part of their biomechanical assessment session when deciding what prescription of orthotics is best for you. Often you cannot see faults in biomechanics when static so movement analysis is preferred when designing your bespoke orthotics. 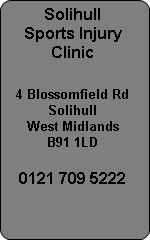 Elite Athletes Meghan Beesley and Nathan Woodward visit the Solihull Sports Injury Clinic for check ups and treatment as necessary. Runners can prevent unwanted running injuries if they have their biomechanics checked and corrected if faults are discovered. Video Gait analysis is offered at shops who sell running shoes, however the level of expertise in analysis is not sufficient to offer you an accurate biomechanical assessment. Basically the assessment in the running shops are designed to help you select a pair of running shoes. Look at it this way, if you need correction because you overpronate then you need correction all of the time not just when you wear the running shoes. Add to this the fact that many people have a different prescription between the left and right foot and running shoes do not cater for this. It makes sense to have correction all of the time and be able to move the correction to any footwear you wish to use. Prescription orthotics are the answer! !